You are here: Home > The Henchmen Team Is Celebrating Free Comic Book Day! 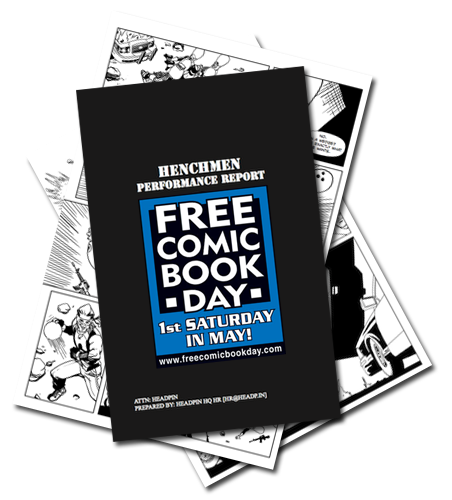 The Henchmen Team Is Celebrating Free Comic Book Day! This Saturday (May 4th 2013) is Free Comic Book Day, and the team behind Henchmen has decided to give anyone on our email list a free preview of issue one (this was previously only available to KickStarter backers). If you missed out on that, be sure to jump over and sign up today! Free Comic Book Day is a single day – the first Saturday in May each year – when participating comic book shops across North America and around the world give away comic books absolutely FREE* to anyone who comes into their stores. *Check with your local comic book shop for their participation and rules. Be sure to check it out this Saturday by finding a shop near you with their handy store locator. I’ll be stopping by one of my favorite Downtown Comics locations for sure! The book is coming along very well, by the way – expect to see a lot of updates coming through HenchmenComic.com in the coming weeks. I am super excited for everyone to see the book. Thanks again to everyone for reading, backing, and sharing our KickStarter project, and even helping us overfund and go color! Be sure to subscribe, retweet our tweets, like our Facebook statuses, forward to friends, call your friends, print out the site and fax it to your friends, and generally do all you can to let people know that they’ll love it!